Chia seeds were a key part of the diet and culture of ancient civilizations, including the Aztecs, Incans, and Mayans. The Tarahumara and Chumash people in Mexico would create a ‘running food’ by roasting, crushing, and mixing the seed with water to make a gel. Chia seeds are a strong vegetarian source of omega fatty acids, protein, calcium, antioxidants, minerals, vitamins, and soluble fiber. The slightly crunchy seeds absorb liquid and swell up to form a gel that helps to support hydration and gives a feeling of fullness. Sprinkle the mild nutty-flavored seeds into smoothies, oatmeal, granola, cereal, and yogurt, or use them as a thickener. Navitas Naturals Chia Seeds provide a wide diversity of key nutrients in abundant quantities. In particular, chia seeds are a plentiful plant-based source of omega fatty acids. They’re also a robust source of protein — providing all of the essential amino acids. This mighty little Aztec energy food also contains antioxidants, complex carbohydrates, vitamins, and minerals (calcium, magnesium, potassium, manganese, and phosphorus). 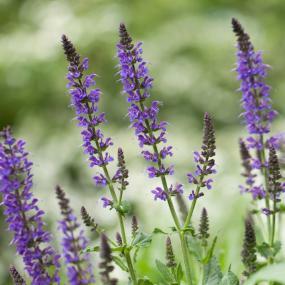 The chia plant is a fast-growing herb that is part of the mint family. It’s white, blue, and purple flowers produce small, shiny, oval seeds. To ensure quality, flavor and nutritional integrity, our farming partners follow the strictest growing and processing standards. Product of Mexico, Argentina, and Paraguay, packed in the USA. The mission of Navitas Naturals is to provide the finest organic superfoods that increase energy and enhance health. Our products are certified organic, kosher, gluten-free, non-GMO and raw. Harvested from around the world, Navitas Naturals superfoods are a diverse whole-food source of antioxidants, protein, essential fatty acids, minerals, vitamins, and other key nutrients. We use methods such as freeze-drying and low temperature processing to ensure maximum nutrition and flavor. Chia seeds have a very mild nutty flavor. Therefore, they’re easy to blend into a wide variety of recipes. We suggest that you sprinkle a spoonful into smoothies, oatmeal, salad, granola, pudding, cereal, or yogurt. 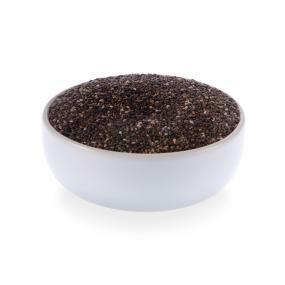 Chia seeds are very hydrophilic and have the unusual ability to absorb liquid and form a gel. This makes chia especially good as a thickening agent in soups and smoothies, or enjoyed as a pudding with a touch of sweetener. The seeds can also be enjoyed in recipes as an egg replacement, and they also work well as a flour substitute to make hearty breads, crackers, and other baked goods. In a blender or food processor, blend the tomato into a chunky puree. Transfer to a small bowl, add the chia seeds, and stir well to combine. Let sit for 10 minutes to allow the chia seeds to swell and the mixture to thicken. 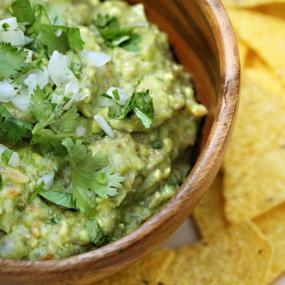 Meanwhile, in a large bowl, mash the avocado with the back of a fork into a paste. Add the garlic powder, onion powder, mixed onion, cilantro, and lime juice, and mix well. Add the thickened tomato-chia mixture and stir. Add sea salt to taste, and spike with hot sauce, if desired, to the preferred heat level. Transfer to a serving bowl and top with extra chopped onion and cilantro. The yield for this recipe is 6 servings.